On Friday I went to work for my biggest client, who uses Internet Solutions as their "service" provider. More specifically, they use ISDSL, the ADSL part of the company. On Friday basically nothing was working: you couldn't use Carbonite, DropBox or even Google Search, Google Drive or Gmail. Twitter.com, like most dotcom sites, was inaccessible. 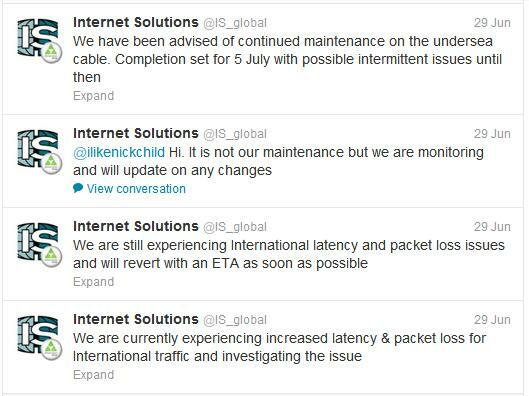 It turns out that one of the major undersea cables, SAT3, was either broken or under "maintenance", and a number of ISPs were affected. Why single out Internet Solutions? Because they are the biggest commercial ISP, and at one time they were the best ISP. Sadly no more. As a client we received no notification from ISDSL, and they wouldn't reply to my questions because I'm not on their Technical Support list. Instead, the only public acknowledgement of the problem was on Twitter, but you needed to use a different ISP to see the message. The graphs above show the story pretty well: each graph shows the download speed for several web sites I monitor: www.fishwisepro.com, www.fact-reviews.com, and www.openaccess.co.za. It measures how long an HTML page takes to download. These graphs are the average of all 4 sites. The top graph is for 2 weeks ago, the bottom graph is the past week. They grey area is the weekend. Notice the large dip on Friday, and another on Saturday. Clearly they don't have a backup plan for this kind of disaster. My own ISP, M-Web, also uses the SAT3 cable, along with the SEACOM cable. They suffered downtime some time back, but clearly they have learnt how to deal with this issue. My home ADSL service was totally unaffected. That's how I was able to read the brain-dead tweets from @IS_global. 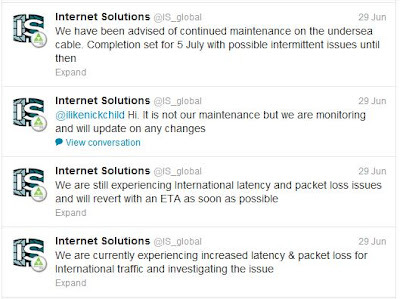 It was imposible to see these tweets from an ISDSL connection. They clearly have no idea what the word "revert" means. Update Tuesday 3rd July: Duncan Alfers from IS has been in touch, and I have provided him with contact details for my main client, so we can be warned about future problems.